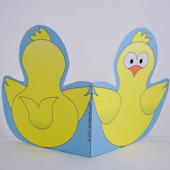 Make simple and fun cards in the shape of a chick, bunny or a pair of flowers. 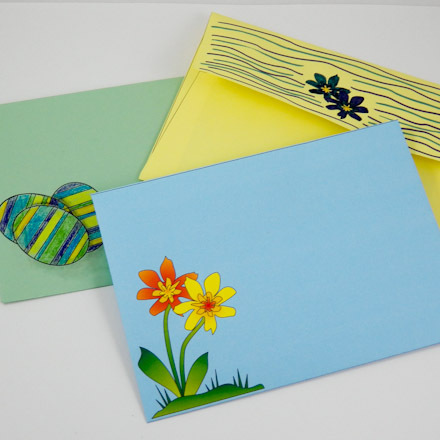 These card projects are simple enough for younger children and people with special needs to make. 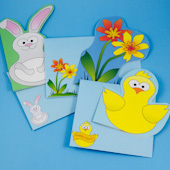 The cards have a theme of renewal for Easter and spring. While the cards are very simple to make, they are designed so that creative touches can be added. Optional supplies: Glitter, tissue paper, and glue. 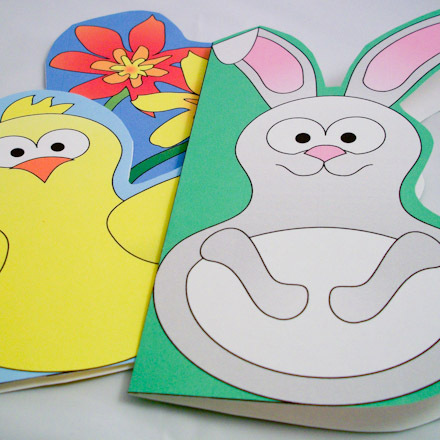 There are three card designs—chick, bunny and flowers. All the card patterns have both a front and a back, and are offered in color and black & white (B&W). While the color patterns are quicker to make, the black & white patterns allow for more creativity. Whichever pattern you use, make the cards truly from the heart by adding your own creative touches. One option is to glue a greeting banner on the front of the card or inside. Matching Envelope: Choose an envelope pattern and print it on paper. The black & white (B&W) patterns work well on white or colored paper. Color the envelope any way you like, and then follow the instructions on the pattern for assembling the envelope. 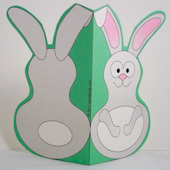 See the Fun Shaped Cards Envelopes Patterns page for more details. Use crayons, colored pencils or markers to add color to the black & white patterns. 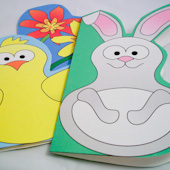 Perk up your card by adding touches of glitter, or maybe a tuft of tissue paper for the tail of the bunny or chick. Use your imagination! Fold the card in half on the black line in the center of the card. Scoring the fold line will make for easier and neater folding. To score a line, you need a ruler and a blunt tip (like an empty ballpoint pen). Place the ruler on the line and trace the line with the blunt tip. This makes a dent in the cardstock that will fold naturally. Cut straight across the bottom of the pattern on the marked line. 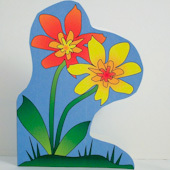 Cut around the top of the card following the shape of the chick, bunny or flowers. Make the cut about ¼" to ½" (0.5 to 1 cm) from the shape's outline. Give the cut gentle curves, and leave a hinge on the left edge. For the chick, leave a hinge from the bottom of the card to the left wing tip. For the bunny, make the hinge extend from the bottom to the left ear tip. For the flowers, the hinge goes from the grass to the left leaf tip. Be sure not to cut through the fold—it is needed to connect the card front to the card back. 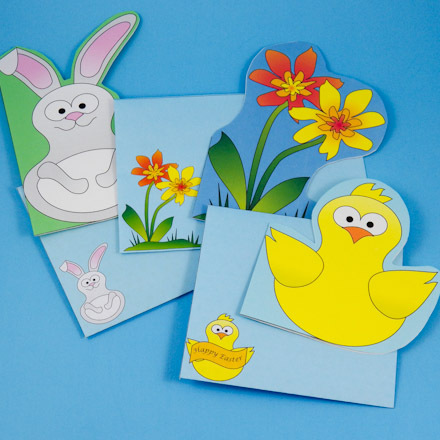 Decorate the inside with things associated with Easter or spring—eggs, flowers, baby animals, etc. Place the card in an envelope. You can use the envelope patterns above to make your own special envelope. You might also decorate the envelope. Tip: You can also add a message on the card front or inside with a greeting banner! Just download and print the pattern for the banners, cut out the banner of your choice, and glue to the card. That's it! Your cards are ready to send! 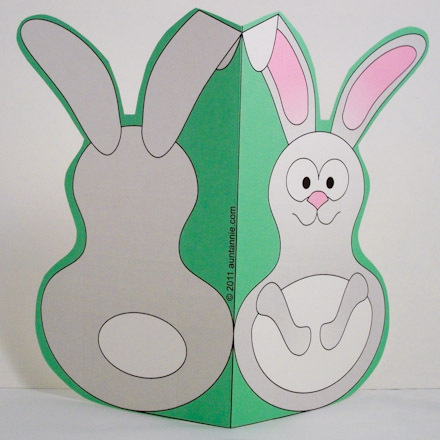 Tip: The bunny-shaped card has a fun back. You could use a tuft of tissue paper or cotton to make a soft tail. 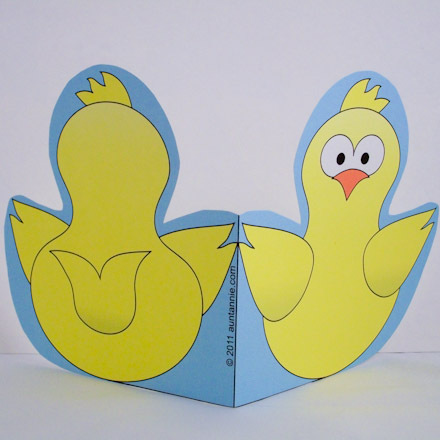 Tip: The chick-shaped card has a fun back, too. Hope your Easter holds a touch of springtime magic! May you enjoy every lovely gift that spring has to offer. Tip: The flowers shaped card can be cut in whatever shape you like or left as a rectangle. 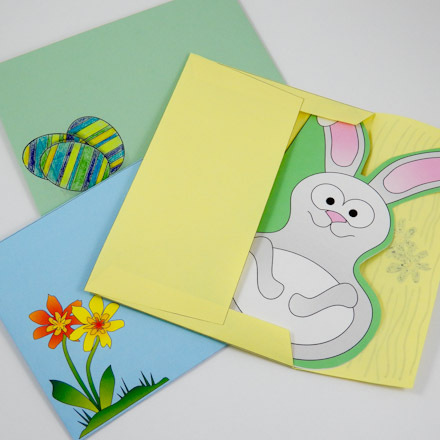 Project Extra: Use the envelope patterns included in this project to make envelopes to fit the fun shaped cards. 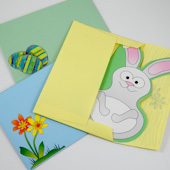 Or see the Fun Shaped Cards Envelopes Patterns page.